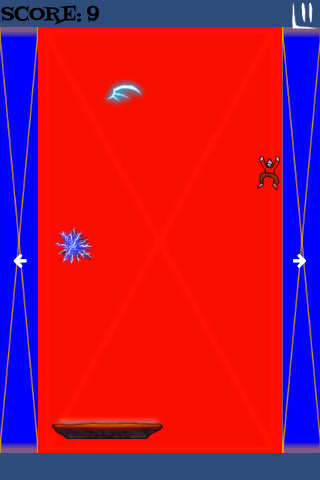 Decided to leave the tutorial levels till later and do something more fun – adding the demon levels. The first demon’s lightning attack is fully functional. Lightning randomly appears on the screen and it’s size,number and frequency gradually increase as your score increases. Touching it will shock you causing you to be unable to move left or right until you land on the platform (updated during dev). There is also a visual warning before the lightning appears and the character’s shock animation is also in. The white arrows have been updated to use the fontAwesome icon font. Also the start menu is “fully functional” in that you can navigate between that and the levels but nothing to see yet. What’s next: doing the other demon attacks: fire and ice.